Perhaps one of more confusion images to come out of the Second World War are photographs of Chinese soldiers wearing German helmets. Some of the confusion may come from knowing that the Germans were allied to the Japanese. 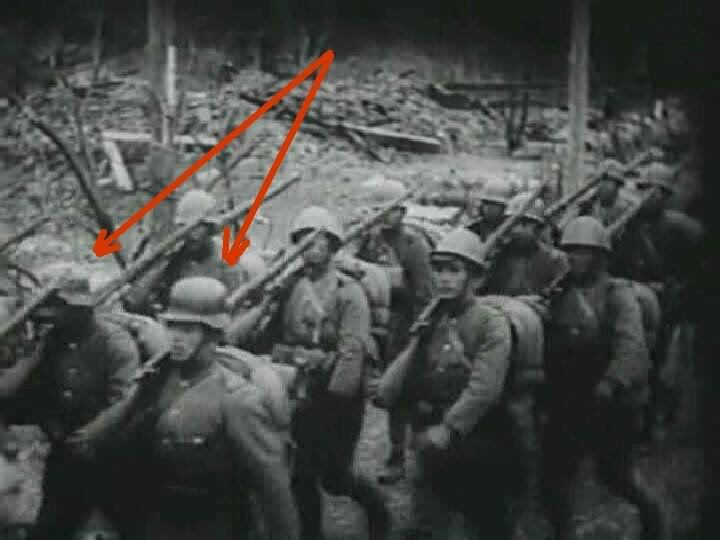 If Japan was fighting the Chinese, then why were the Chinese wearing German helmets. In truth the helmet in these photos are not Chinese copies but are in fact real German produced helmet. The reason as to why the Chinese are wearing them lay in the complex relationship that existed between Nationalist China and Germany in the 1930s. Cooperation between Germany and China was in fact a logical choice. In the 1930s China and her army were in desperate need of modernization. Although the threat from war-lords had mostly been dealt with by the 1930s China’s ability to produce manufactured goods was far behind what was needed. China faced a growing threat from Imperial Japan and an internal communist threat which wished to over through the Nationalist regime of Chiang Kai-shek and insert themselves as the rulers of China . If Nationalist China wished to confront both these threats it was going to need a modern military with the latest equipment. While China may not have possessed the ability to manufacture the modern equipment it needed it did have plenty of raw materials, which it could use to obtain what it needed. The question was who could China turn to? The U.S., Great Britain and France all had territorial concessions with China. All three nations preferred a weaker China which would not threaten their trade agreements and territorial concessions. Although the Soviet Union had aided the Nationalist government in the past they clearly had political designs on China. Germany on the other had lots its colonies including it’s Chinese concessions after the treaty of Versailles. In the post WWI era Germany no longer had colonial designs in the far east. While Germany had a powerful manufacturing capabilities, they lacked access to the raw materials they needed, limited by the treaty of Versailles. In an era where Germany had few friends, it seemed an alliance would be perfect for both countries. China could export its raw materials to Germany who needed them, in return China could procured military equipment to modernize it’s armed forces. 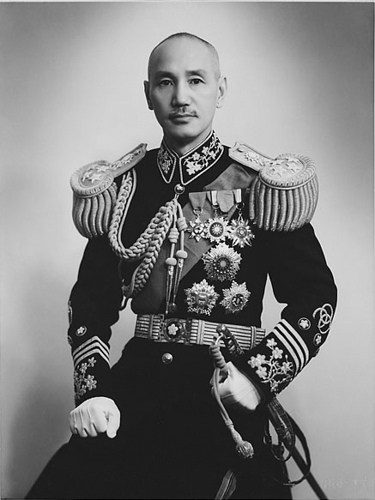 Chiang Kai-Shek, the heads of the Kuomintang also greatly admired Germany. Chiang believed that lesions from Germany’s unification could be emulated in China. It was this relationship that was formed between China and Germany that would lead to the Chinese military’s purchase of German M35 helmets for their own use. As China moved to modernize it’s armed forces the choice of a German helmets was a logical one. 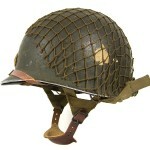 The M35 helmet was the most modern steel combat helmet of it’s day. Made of press formed molybdenum steel, the helmet offered excellent protection, with a skirt that guarded the wearer’s neck and ears and a visor that offered some face protection. 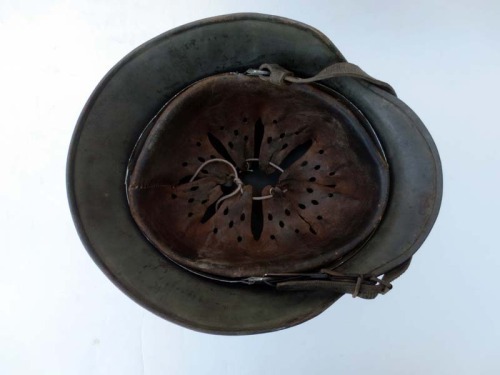 The helmet weighed far less that it’s Great War predecessor, but was made from superior quality steel. 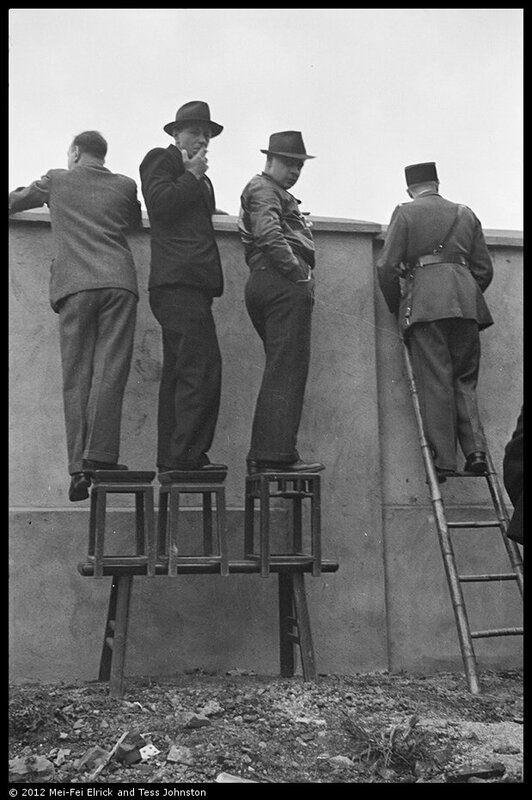 The helmets were made in seven sizes, from 60 cm up to an enormous 72. The helmet also had an improved liner system made of two aluminum bands secured into the helmet with the aid of three brass pins and slotted washers. An outer band secured the liner into the helmet while an internal band held leather suspension with a wool felt pad for added comfort. The aluminum liner used during this era is referred to by collectors a the unreinforced version. Between 1931 and 1937 German factories produced this version. It was soon found that the soldier’s practice of hanging the helmet by it’s chinstrap from field gear when on the march or when not in use would warps the liner’s outer band which after time would cause the band to fracture. 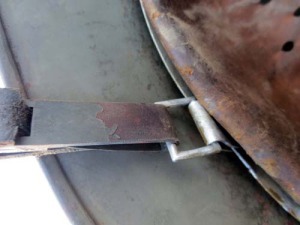 In 1937 the Germans redesigned the outer band by riveting two strips of aluminum to both sides of the band thus reinforcing it. These 2nd pattern liners never saw service in China, as at the time of their production Sino-German cooperation was at an end. Unreinforced and reinforced M31 liners side by side. Chinese M35s are found fit with at least three different types of chinstrap. 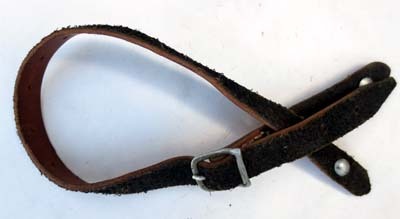 The most common is the German M35 version, a basic leather strap with aluminum hardware, but more then a few have been found fit with the earlier carbine hook, or M27 chinstrap or the double carbine clip strap. These same strap were being used by the German army as well. 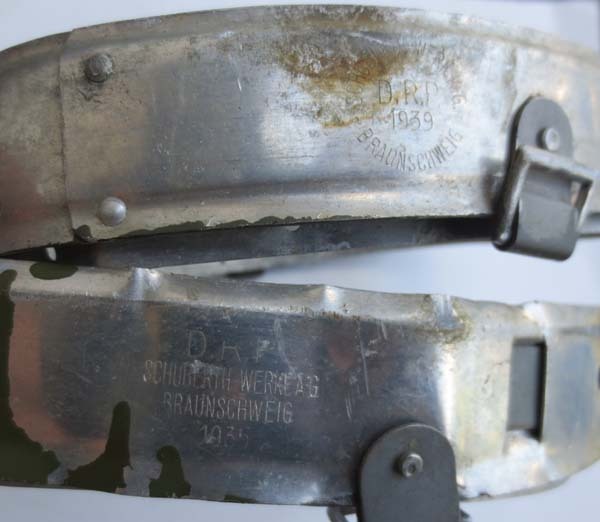 The chinstrap and liners from Chinese M35s are often found devoid of any manufacture markings or dates. At the time of production the German government did not require the marking or dating of military equipment. This did not change until 1937, when the German government ordered their military contractors to maker mark and date all equipment. For this reason many of the helmet component, and even the helmet’s themselves sent to China between 1935 and the 1937 are unmarked. All told China ordered 220,000 German M35 helmets to equip it’s armed forces. In an era in where most of the armies of major world powers were still wearing WWI era steel helmets, China with its newly designed German manufactured helmet would stand out as a modern looking army. These new helmet without a doubt would have boosted the moral of the Chinese soldier who received them, as they were far superior to what other armies of the era were wearing including their enemies the Japanese. 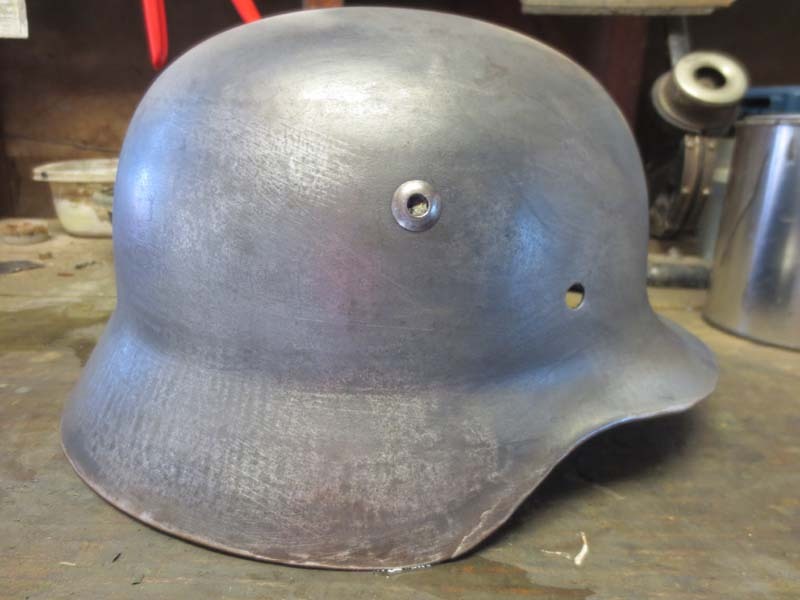 Between 1935 and 1937 the bulk of German helmet production was accomplished by the Eisenhüttenwerk AG. Most of the helmets the factory made went to fill the Chinese order. 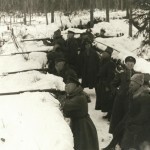 It appears that Eisenhüttenwerk could not produce the necessary number of helmets to full the order and Sachsishe Emaillerwerke, Lauter filled in the gap. Oddly the German government government’s decision to authorize the sale of M35 helmets came at the detriment of their own rearmament. While Chinese soldiers were receiving their new German manufactured helmets the German army was still making do with their antiquated Great War era M16s, M17s and M18s. This seems to have had a long term effect on the German army. 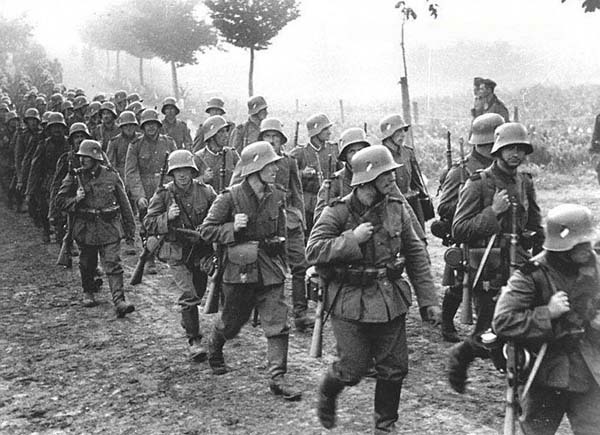 Photos show large numbers of troops, many even from elite units still wearing the helmets from the last world war well into 1940. The helmets the Chinese received from Germany were identical to the helmets the Germans themselves wore. The color, was a smooth shade of low gloss green-gray. There was no specific shade of “Chinese” field gray. 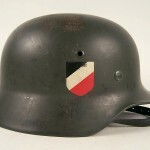 That being said with German helmets produced in this era the shade of field gray could vary greatly from pale gray to a darker “apple green”. One interesting feature often found on Chinese M35s is a small prone lion stamp in purple or black ink on the inside of the helmet’s dome. The prone lion is the company mascot of Eisenhüttenwerk AG. Eisenhüttenwerk AG usually marked their helmets with a small gothic ET on the inside of the helmet’s skirt. So the addition of a prone lion to mark the helmet as being produced by Eisenhüttenwerk AG seems unlikely. 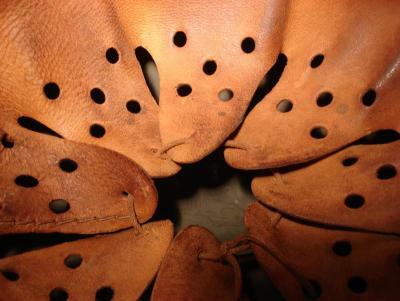 The addition of the prone lion may have been quality control mark similar to the dated dome stamps that ET inspectors would use in the years a head, when approving helmets for military use. 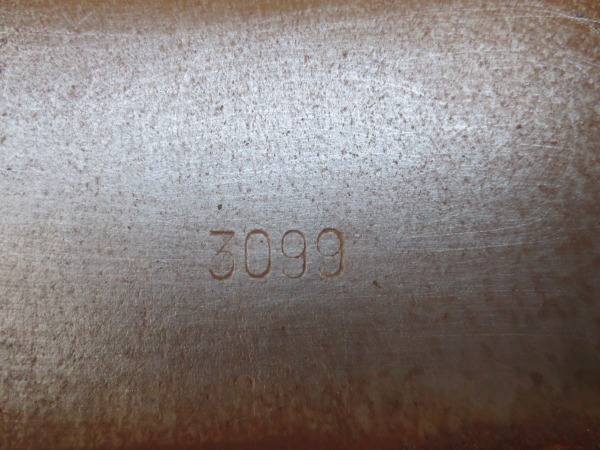 On the back inside of the helmet’s skirt each shell is stamped with a heating lot number. This number was used for quality control at the factory. By following the number sequences the approximate time frame which the helmet was made can be determined. 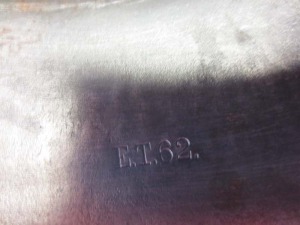 ET marked shells from the Chinese order must have a heating lot number ranging from the low 2000s to the low 3000s. The last helmets of the Chinese order were received by China in 1937 which coincides with heating lot number of not higher then the low 3000s. SE marked Chinese M35s seem to follow the same pattern, starting with a low number of 2075 to a high of 3078. Original German helmets made in this time frame are rarely encountered, as has been discussed this is probably due to the bulk of ET and SEs helmet production went to China. 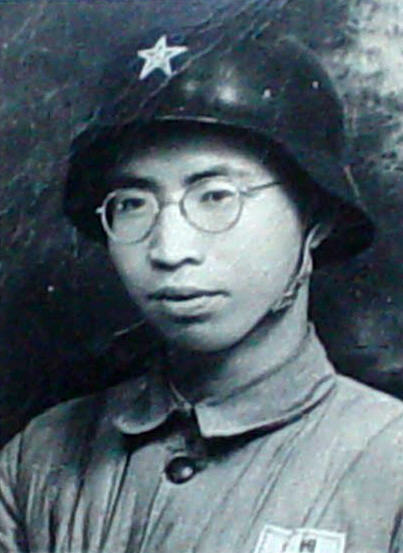 While the helmet’s color, liner and chinstrap system were the same as what the Germans were using the Chinese did made a modification to make the helmet their own. The nationalist insignia, sometimes referred to as a “gear wheel” would be painted on each helmet. When the helmets arrived in China they were devoid of insignia. 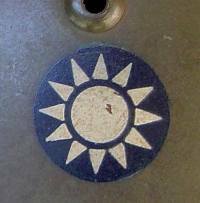 Chinese equipment depots applied the nationalist insignia with the aid of a two part stencil. The insignia were applied with aid an air brush, on the wearer’s left. Decals were not used. 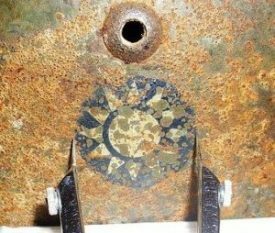 While there does appear to be some slight variation as to the size of the insignia most of the originals measure exactly 3 cm across. A few original photos have surfaced with what appears to be a decal. 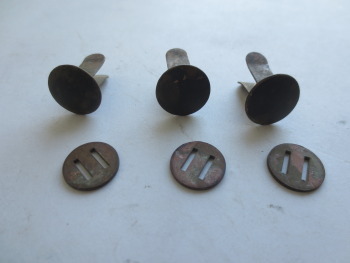 On closer examination these insignia are not decals at all but enamel or metal cap badges. This variation may have been a field modification or perhaps the work of one particular depot. The cap badges would have been readily available and perhaps might have been easier to apply to the helmet’s surface. Whatever the reason these helmets should be considered the exception to the rule, as most photos and original examples show painted insignia to be the norm. 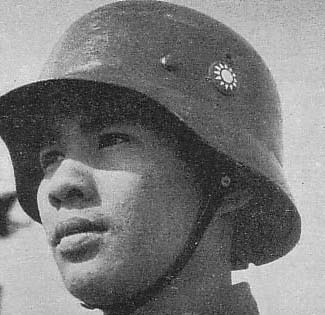 Chinese soldier wearing an enamel cap badge applied to the side of his helmet instead of a painted insignia. 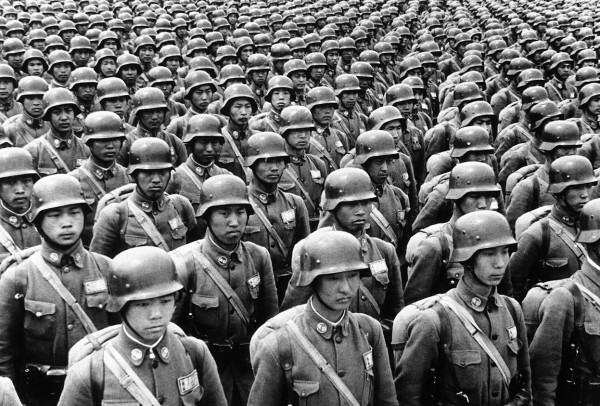 The Chinese soldiers with their new German helmets would not have to wait long to try them out in combat. In 1937 a de-facto state of war developed between the Empire of Japan and Nationalist China. The first major battle of this war would be waged in the streets of Shanghai. 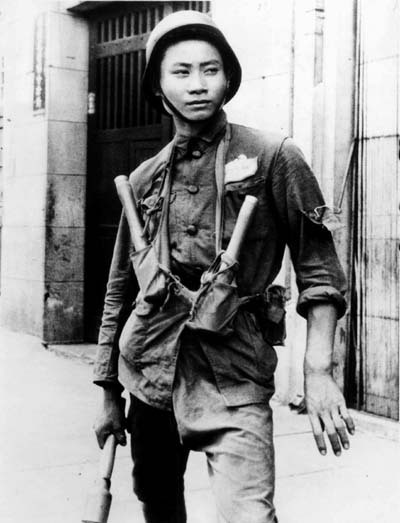 While not all the Chinese soldier who fought in the battle of Shanghai wore German helmets the majority of them did. 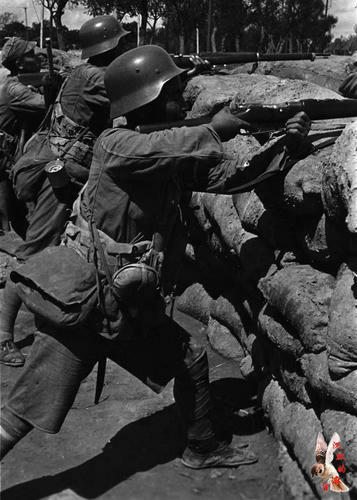 The two best divisions of the Chinese army, the 87th and 88th division who did the bulk of the fighting in Shanghai were equipment entirely with German helmets. 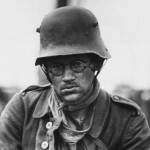 It may seem odd, but the newly designed German helmet, a helmet designed for the German army which even to this day symbolizes the German soldier of WWII did not see combat with the Germans first. The helmet would be first blooded by the Chinese as they clashed in fierce urban warfare in Shanghai against the Japanese. While the Chinese fought valiantly in the streets of Shanghai and later in Nanking they would not prevail against the Japanese. The loses of both battles called into question whether China could withstand the Japanese onslaught. After seeing the Japanese armies performance Hitler decided it made more practical sense to ally himself with the Japanese. It was at this point that Hitler recalled all German advisors to Chinese army, and business agreements with China were cancelled. This included further shipments of German helmets and components, the last shipments arrived in China in the early part of 1937. 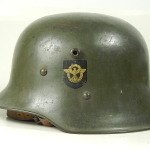 While Chinese were unable to procure more German helmets they would continue to use the helmets they already received. As liner and chinstrap wore out, new locally made ones were substituted. As World War II continued China found new allied with the British and Americans. Soon the old worn out German helmets would be replaced with U.S. made M1 pots. However it was not the end of the use of these helmet. Chinese guerilla both Nationalist and communist alike would continue to wear German helmets they hand managed to procure throughout the war. 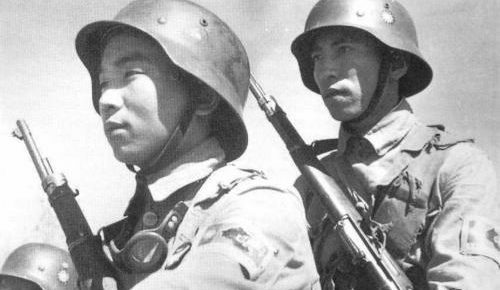 Surprisingly even after the defeat of the Kuomintang in 1949 the Communist Chinese army would continue to re-work and reuse these the now antiquated German M35s helmets well into the 1950s. 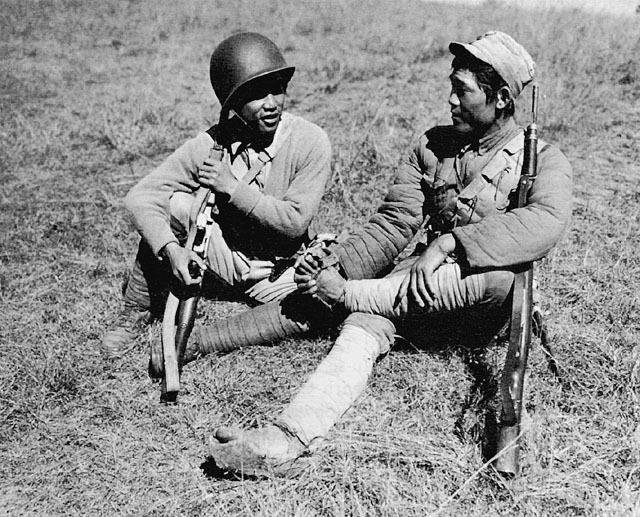 There are even reports of these helmets being worn by Chinese troops fighting during the Korean war. One can only imagine the confusion some of the U.S. troops might have experience who had fought the Germans in WWII once again coming up against troops wearing that helmet, but now in the far East. 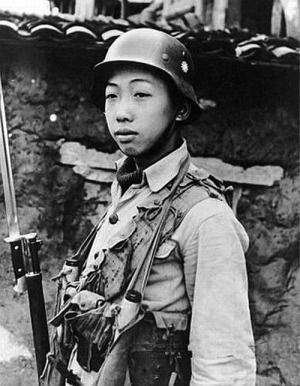 Member of the Communist Chinese People’s liberation army wearing a re-worked German M35. This photo was taken between 1950 and 1955. Today Chinese M35s are highly sought after by collectors. A Chinese M35 in it’s original WWII configuration can fetch thousands. In truth few of these helmets managed to survive unaltered to reach the modern day collector’s market. Unlike the European theater where thousands of German helmets were picked by Allied servicemen for a souvenir and sent home, the situation in China was different. After the fall of Shanghai in 1937 more then a few British and Americans left the international settlement where they had safely watched the battle of Shanghai play out before them and toured the battle ravaged streets of Chapei. It is more than likely a few of them picked up a fallen Chinese M35 helmet as a curiosity or remembrance to the titanic battle they had witnessed. At the end of WWII there were a number of American military personnel stationed in China, both in Shanghai, and Peking. A few of these Chinese M35s have been traced back to veterans who purchased them from venders in the streets of Shanghai or picked them up from forgotten KMT supply depots. However these helmets managed to get to the collector market today it is more then certain that only a small fraction of the 220,000 which China received survived to reach the collectors market today. 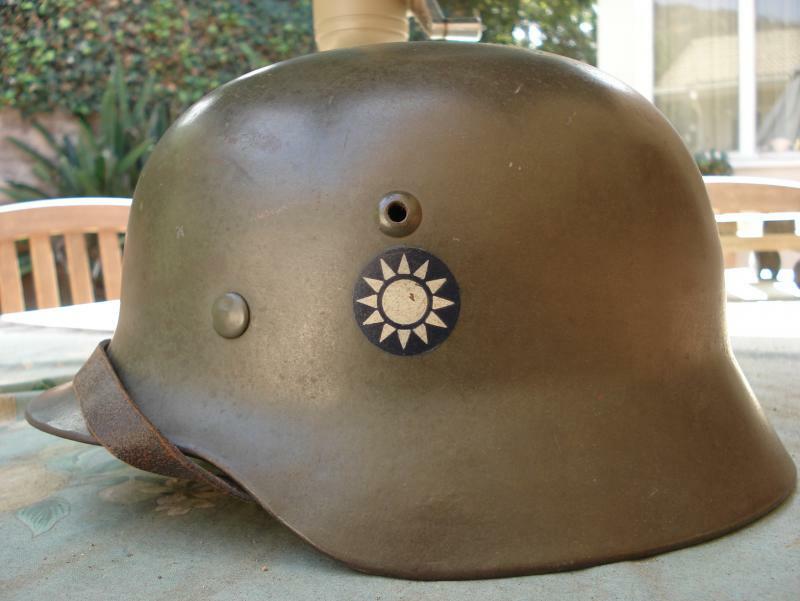 This would make the Chinese M35 one of the rarest helmets of the Second World War. 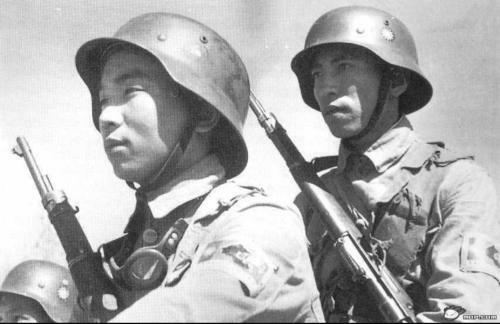 PRC troops wearing German M35s helmets during the Korean War.